This morning we make our way north along the Silver City Highway, to Broken Hill. The town was created to serve miners in the incredibly rich silver, lead and zinc mines of the Barrier Ranges. We enjoy an interesting tour of Broken Hill and visit Whites Mineral Art and Mining Museum. We visit the Silver City Mint and Gallery where we see the spectacular Panorama. We enjoy our Overnight Stay at the Silver Haven Motor Inn, Broken Hill. This morning we make our way to Camerons Corner, where New South Wales, South Australia and Queensland meet. We continue along the Strezlecki Track to Innaminka. This tiny settlement is built around a hotel and trading post on the Strzelecki Track. Innamincka played a part in explorer history, with the Burke and Wills expedition of 1860-61 being played out under the dig tree. We visit the place where Robert OHara Burke died on the Cooper Creek before we settle in for the Next Two Nights at the New Innamincka Motel. A relaxing start to the day as we take time to discover Innamincka. This tiny settlement is built around a hotel and trading post on the Strzelecki Track. We visit the Dig Tree an enduring reminder of the ill fated Burke and Wills expedition and also the memorial to John King, the only surviving member of the Burke and Wills group. This afternoon we enjoy a discovery cruise on the Cooper Creek, this is sure to be a highlight of the tour, the area abounds in birdlife so dont forget your cameras. We depart Innaminka and make our way to Birdsville. In the Channel Country it seldoms rains, but the northern monsoons cause rivers and creeks to flood in an effort to reach Lake Eyre in South Australia. We travel north, crossing the border into Queensland and make our way to Birdsville. Birdsville is famous for the starting point of the Birdsville Track and for the annual horse race. We settle in for the Next Two Nights at the famous Birdsville Hotel. This Morning an exciting day awaits and one that will certainly be a highlight of the tour as your Once in a Lifetime Experience begins, we enjoy the spectacular scenic flight over the north end of Lake Eyre in all its glory. We then explore Birdsville, which was first settled in the 1870s that grew as a centre for moving cattle south and as a custom post. Tucked between the sands of the Simpson Desert and the gibbers of the Sturt Stony Desert it is set down on what Burke described as that magnificent creek, the Diamantina. The explorers, Sturt, Liechhardt, Gregory, Burke and Wills were all here before this little town existed. Of special interest is the Hotel and Racetrack, corner stones of Birdsvilles high profile. This afternoon we enjoy a tour out to Big Red, which will take us through the Diamantina flood plains, Stuart Stony Desert gibber country and visit the mighty Big Red where the Stuart Stony Desert and Simpson Desert meet. After a hearty breakfast we make our way along the Diamantina Development Road through Windorah as we travel to Historic Ray Station, originally settled by Sarah Tully, Sarah being the sister of the famous Patsy Durack. This station has been owned by the Tullys for more than 150 years. We enjoy the hospitality of the Tullys as we settle in for the Next Two Nights. An interesting day is spent on the property, as we see the two museum buildings, both of which date back to the turn of the century, listen to the colourful stories, which bring to life the photographic displays. We visit the family cemetery, where two generations are buried, the sites of the blacksmiths shop and the first homestead. This afternoon we enjoy an in depth look at life on an Outback Station. This evening we enjoy dinner and the chance to share experiences around an open fire. We farewell the Tullys thanking them for the history and hospitality. We make our way to Quilpie, for morning tea. Quilpie was established as a centre for the large sheep and cattle properties of the area, but is better known for its bolder opals. From Quilpie we make our way along the Development Road past the Mud Springs to Cunnamulla for lunch. We then head south through Barringun to Bourke. In the early 1860s Bourke was established as a mercantile centre and port to serve sheep runs along the upper darling. 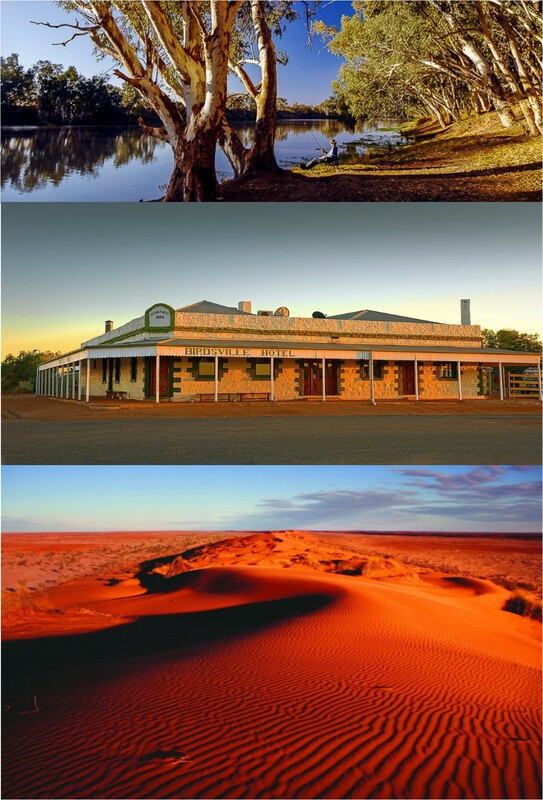 Bourke is a town on the edge of the wilderness, firmly etched in Australian folklore, with great historical, cultural and geographic significance. We settle in for our Overnight Stay at the Bourke Riverside Motel. we then travel onto Cobar for our overnight Stay at the Town & Country Motor Inn Cobar. After a relaxing morning we depart Cobar heading down the Kidman Way arriving at Griffith for lunch. We then travel onto Tocumwal via Finley crossing the Victorian border ending our memorable Land of Infinity Tour.